I've always been fasinated by the influence American life and culture has around the world, especially as it relates to music. Sometimes the influence isn't so good, take rap and hip-hop music for instance. Or worse, disco. Ugh. Then there's times when it's positive, like southern rock and blues. 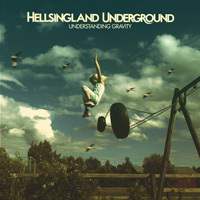 Enter once more, Sweden's Hellsingland Underground with their fourth album, Understanding Gravity. They transport themselves, and us, back to 1977, to a front porch, near a meandering river, somewhere between Memphis and Muscle Shoals. To describe Hellsingland is to repeat myself from previous reviews. Their music is classic rock, American southern rock inspired, definitely touched with country music, with hints of roots music in the blues. Think the likes of Allman Brothers (heavily), the Marshall Tucker band (without the flute), Buffalo Springfield, Little Feat for some boogie, maybe some of The Band, though they were from Canada, but drummer Levon Helm was from Arkansas and, maybe some UK inspiration like Canned Heat or The Yardbirds. Believe me when I say, largely, not too many bands are playing this type of music internationally. Maybe Kings Of Leon, but they're basically an alt/indie band with southern nuances. Perhaps Hellsingland Underground can be defined in one signature song here, You Saved Me. If you don't hear the clear Allman Brothers vibe in the guitar line, you're tone deaf. But the guitar lines are definitive to their sound. Clean sharp lines, with that southern angle and some Seventies fuzz. Toss in some Hammond, Dobro, and harp, and their sound deepens into the soul of the South. One of the more country sounding songs comes with Golden Haze, a bit of brisk number with a steady groove. And groove is also a musical theme here. Most songs rock, but not like hard rock, not heavy, just smooth and earthy. Bottom line: With Understanding Gravity, once more Hellsingland Underground displays their ability to create classic American Southern rock far better than most other modern practicioners, probably most Americans. 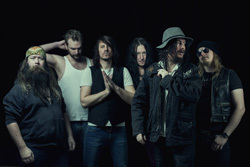 They're Allman Brothers for the 21st century, not copycats, yet different. Recommended. With Understanding Gravity, once more Hellsingland Underground displays their ability to create classic American Southern rock far better than most other modern practicioners. They're Allman Brothers for the 21st century, yet different. Recommended.